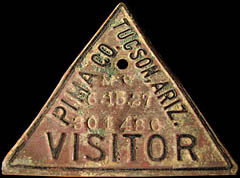 Still attached to the visitor from Indiana's 1927 plate. 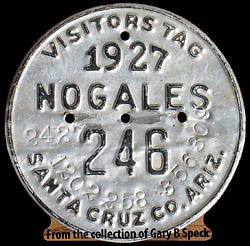 Arizona had laws on the books as far back as at least 1916 regulating vehicles coming into Arizona from other states. 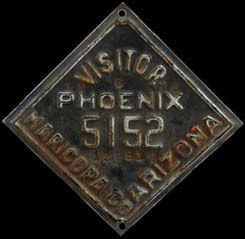 Arizona giving the name and other details of the car and declaring how long they expected to remain in the state. 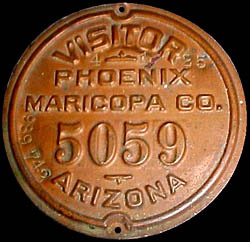 By February 1922 the law stated that all motorist bringing a car from any other state must register at the first available place. Those that did not comply would be arrested. Nothing is known about how these tags were used or when they were first implemented. Tags are not to scale with each other. The 1926 measures 4 in. per side. All have been hand-stamped with a date in the upper-half.